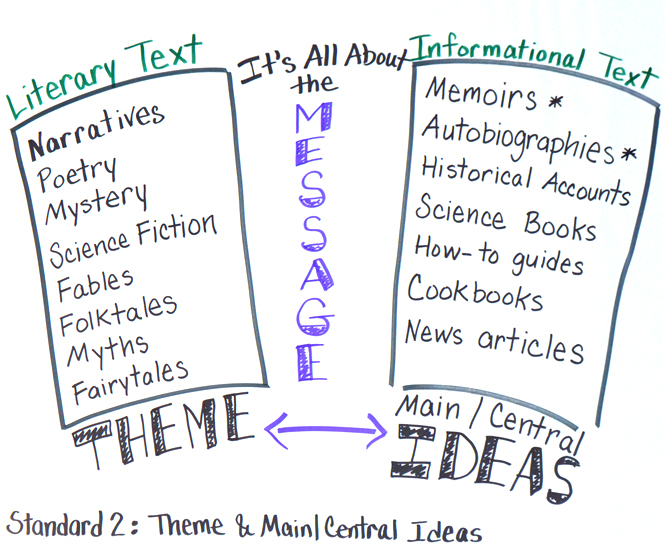 Theme and main/ central idea are the two different terms used in the Anchor Reading Standard 2. While different terms, both get at the same core concept: message. What does the author want the reader to take away? This is confusing for students and most adults. Teaching it as two different concepts is challenging. So how do introduce these concepts? As one! I work with teachers to introduce this as one concept, with two different names. The title of this chart, It’s All About the Message, captures this notion. This chart was created with sixth grade students. You will notice that we used both main and central. We chose to do this because these students had just spent the previous year calling this the main idea. Now, as middle school students, the term had shifted to central idea. We wanted them to connect the two ideas and recognize them as synonymous. Vary the types of informational text and/ or literature that you list to suit your classroom. These choices made sense for what we were learning that year. Our list is not exhaustive. Some basics, like biographies had not been included. This list can and will grow throughout the year. Not good with the large text? Use a large sticky note or colored paper to write them, ideas, and message in an attractive format in advance. Stick it onto the chart as you discuss each term with students. Note the asterisks next to memoirs and autobiographies. We talked a lot about how these are considered to be true and based on facts. We then explored how the validity of that assumption depends on the honesty of the author. For the name of this chart, use the name from your standard only. Main idea is for elementary students. Central Idea is for middle school students. This is the best article I have seen on this standard. Thanks for the thoughtful ideas and teaching tips.